Interactive selection of objects in the working area is handled through command modes. Each select command mode is aimed for a specific kind of object. When selecting an object it will be flashed in the working area and the property toolbar will be updated with the object properties. During interactive selection the system will in conjunction with the Shift key pressed, enable for multiple selection of objects in an inclosing window or in conjunction with the Ctrl key pressed, add a new single selected object to the existing selection pool. Objects can also be selected from one of the many toolbars by a single click. 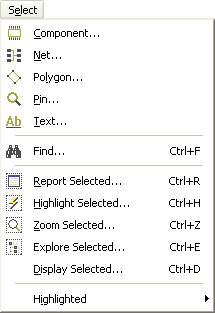 Futhermore a dobbelt click in the toolbars will execute a zoom object command and zoom, flash and select the object.